Ari Ant lives on the preschool playground and is eager to watch and participate in his own way with the children’s activities and celebrations. Unnoticed by the youngsters, Ari listens one afternoon as the teacher begins to read a story about the holiday Lag B’Omer. Lag Ba’Omer is a joyful day celebrated between the holidays of Passover and Shavuot and commemorated with picnics, bonfires, singing, and storytelling. The children prepare for the traditional holiday picnic through various play activities. Ari is eager to join in but is very disappointed when he bites into a hard plastic cookie, is nearly buried in a sandbox cave, and then falls into a puddle of glue. “I’m not sure I like Lag B’Omer!” remarks the little ant. But at the actual picnic at a nearby park, Ari is able to fully enjoy and partake in the food, Torah stories, and warmth of a bonfire, declaring Lag B’Omer “the perfect holiday” for an ant. 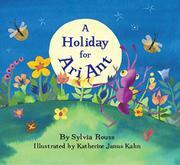 As with her signature Sammy Spider, Rouss creates a character who is inconspicuous to the crowd of humans yet provides a gentle entree to the holiday with a bit of suspense and satisfying denouement for very young children; Kahn contributes cheery illustrations in her familiar, Eric Carle–style collaged art.